Here's another article from our friend Jarrod Frenzel in the Woodlands, Texas. We're always happy to hear from him and learn about his neck of the woods! The Woodlands, TX - There's a Place Here for You! First, it's a stunning community. Just flat-out, no two ways about it, a drop dead beautiful area. The goal of any master-planned community is to give each resident exactly what they need to live their perfect lifestyle. This means that the development was planned to accommodate couples, families with children of all ages, retirees, single adults and seasonal vacationers. Price-wise, there is housing available for any budget and any lifestyle; seek and ye shall find...The Woodlands' slogan is “Come Home”, and that pretty well expresses their overall attitude and atmosphere. Of course, being built into a 28,000 acre natural forest, to say it's an outdoors-oriented community would be an understatement. This not-so-little slice of nature is about 30 minutes outside of Downtown Houston and was built to be YOUR dream home, no matter what that may be. 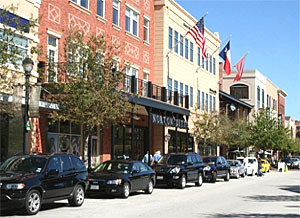 The Woodlands offers a unique choice to the Houston real estate market. There are apartments, single story houses, villas, and more available throughout the 11 different villages inside The Woodlands...You just have to find out where you'll fit best and go there. Prices range from $100K all the way up to $5M, although the average is probably something around $300K. Of course, that's not taking apartments into consideration, which are available for those not inclined to property ownership. The Woodlands has something in every price range. Now, one of the unique aspects of this real estate market that you have to take into account when browsing listings in The Woodlands is that you're looking at a relatively balanced economy compared to the rest of the United States. Unlike most areas right now, it is NOT necessarily a buyer's market, although it's certainly not a strong seller's market either. Remember that this is the bestselling masterplanned community in Texas since 1992; this little corner of the real estate market has remained active and coordinated throughout the recession that so desolated the rest of the country. Of course, as a buyer this doesn't have to be a bad thing...For anyone seeking low risk property investment, The Woodlands, Texas is a dream come true! I hope you'll take the time to visit The Woodlands' website and see what the community has to offer. I'm sure you'll find it appealing, and then you can start browsing listings to find a home you can fall in love with.